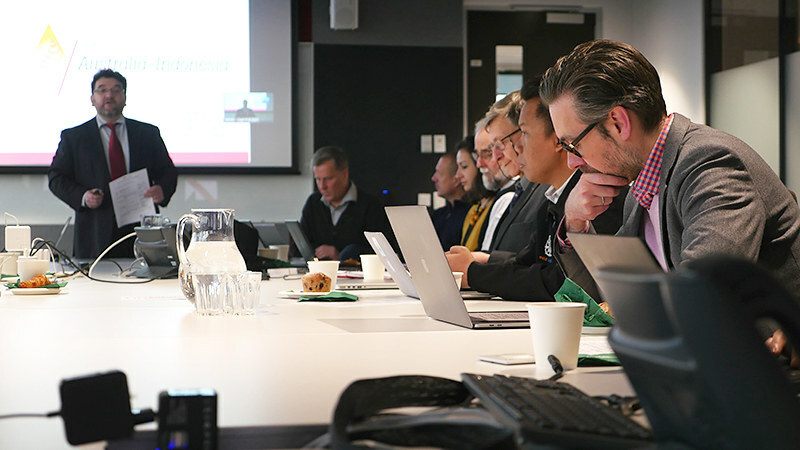 The Australia-Indonesia Centre’s Energy Cluster concluded its bilateral research with workshops at the Australian National University and Monash University in July 2018. Researchers from ANU, Monash, the University of Melbourne, Institut Teknologi Bandung, Universitas Hasanuddin, the University of Sydney, and the University of NSW came together with government and industry stakeholders to share their findings across the spectrum of sustainable energy technology, public infrastructure, government policy and social impact. “The Cluster’s strength lies in its ability to draw together key Australian and Indonesian players in the field of energy to work on complex issues, some that need a deep understanding of social and regulatory challenges combined with cutting edge technology research,” says Energy Cluster Co-Lead and Coordinator Dr Igor Skryabin of ANU Energy Change Institute. Cluster Co-Lead and Deputy Director of the Monash Energy Materials and Systems Institute, Dr Ariel Liebman, suggests both nations can readily implement a mostly renewable energy system by 2035, if proper planning and coordination is combined with effective government policy underpinned by new grid planning technologies. The Cluster’s research recommends stronger targets for renewables and carbon pricing, combined with an energy market design where transparency of costs is produced across all aspects of the electricity supply chain, from fuels to generation, transmission, distribution and retail. Policy strategies were explored through presentations on Indonesian Distributed energy policy framework by Dr James Prest (ANU), South Sulawesi renewable energy assessment by Dr Ardiyati Arief (Universitas Hasanuddin), grid and off-grid system planning by Dr Liebman, and community empowerment by Dr Sebastian Thomas (University of Melbourne) and Dr Max Richter (Monash). On the more technical side, Dr Mohammad Bachiter (Universitas Hasanuddin) presented on power system integration, Cluster Co-Lead Professor Ulfah Segar (IPB) on biomass based energy, Professor Pekik Dahono (ITB) on DC microgrids for remote areas, Professors Ke Meng (UNSW) on operational energy security, and Professor Saman Halgamuge (University of Melbourne) shared research on battery optimisation. Professor Kalirajan (ANU) and Dr Matt Jeppesen (University of Melbourne) reported outcomes of Cluster Energy Technology Assessment Program. The workshop included a student session where ANU Master of Energy Change students from Indonesia presented individual research projects addressing innovative approaches to renewable energy deployment in Indonesia. The need for capacity development of renewable energy professionals in Indonesia was discussed in a session led by Mr Andre Susanto, Senior Vice President of Inovasi Dinamika Pratama. The workshop was concluded by a broad discussion of future Australia-Indonesia energy research program. Delegates also participated in a site visits to ANU energy research laboratories, Windlab facilities in Canberra, and Monash University’s Clayton campus where Dr Yasmina Dkhissi shared the strategies the university is implementing to pursue the emission-free Net Zero Initiative.